Banks have yet to perceive meaningful pain from alternative lenders yet are motivated to improve their customer experience and capacity for scale. Boston, September 22, 2016 – Disruption, one of the most dreaded and examined of all business phenomena, has come to the banking industry in the form of alternative lenders. These unregulated, non-bank operators use cheap capital and digitization to offer credit to riskier small and midsize businesses, and typically promise to respond to credit applications within minutes or hours. Given the precedents, the hype associated with the alternative lenders is warranted. But will the traditional bank, whose demise has repeatedly and inaccurately been predicted for some time now, really go the way of the bookstore or the pony express? 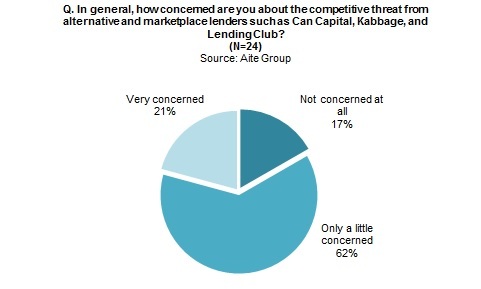 Based on a quantitative survey of large banks active in the SMB lending market in North America, this piece explores banks’ challenges with achieving scale in SMB lending, the antidotes they seek to get over this barrier, their opinions of the alternative lenders as a competitive threat, and their appetite for partnering with alternative lenders. This 22-page Impact Note contains 11 figures and three tables. Clients of Aite Group’s Wholesale Banking & Payments service can download this report, the corresponding charts, and the Executive Impact Deck. This report mentions Bank of America, Can Capital, CIBC, Kabbage, Lending Club, JPMorgan Chase, and Thinking Capital.